While governments and law enforcement continue to grapple with theominous potentialof drones, the solution looks likes it could actually be much more simpleandarchaic than imagined. So far, the project is just a trial, withthe policeassessing whether they want a full fleet of drone-busting birds of prey. Drones are becoming cheaper and more accessible, heightening fears that they could be used by criminals or terrorist groups. In this vein, the Japanese police force hasrecently announced they will deploy a battalion of anti-drone officers and disabling drones. In the future drones will be used increasingly, so [it]will increase the number of incidents involving drones,the Netherlands Police said in astatement.Drones can also be used for criminal purposes. The security firm says that the technique they use is not harmful to the birds and is no more dangerous than the scraps they get into with prey in the wild. In fact, their feet are heavily scaled to specifically protect them from sharpbites, slashes, and scratches. 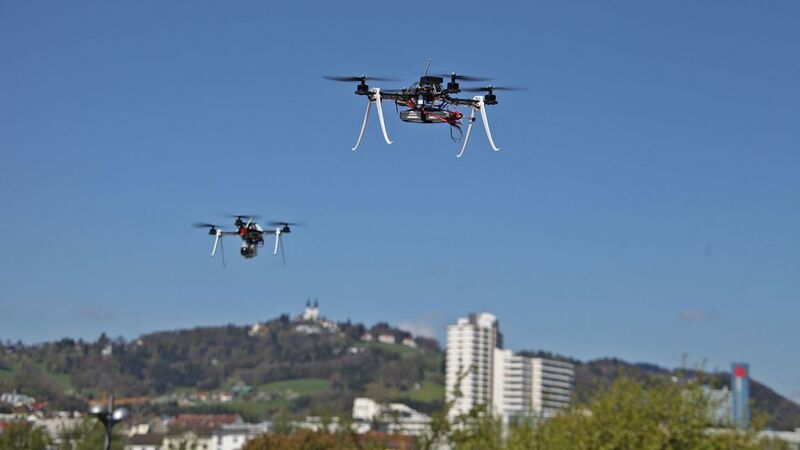 Even so, the company is working with the Dutch Organization for Applied Scientific Research (TNO) to assess whether the drone propellers affect the birds talons. In a press release, Guards From Above said, We use the birds natural hunting instincts in order to intercept drones. We do this safely, quickly, and accurately. The animal instinct of a bird of prey is unique. They are made to be able to overpower fast-moving prey. Sometimes the solution to a hypermodern problem is more obvious than you might think. A drone journalist is suing a local police department in a case that may provide a stepping stone to broader legislation dealing with who has the right to fly drones and take video from the sky. Pedro Rivera filed a suit against two officers of the Hartford, Conn., police department on Feb. 18 after they convinced his part-time employer, a local TV station, to suspend him for a week that began on Feb. 3. The suspension followed a department investigation into whether Rivera illegally used his drone to film the scene of a fatal accident. Rivera says the officers had no right to interfere with his drone and had no reason to call his employer. He hopes to gain compensation for his loss of work as well as punitive damages from the two officers, and he wants the Hartford police to make it clear they have no right to stop individuals from using drones. The journalist was allegedly not working when he heard chatter over his police radio, according to the lawsuit Rivera filed. A bad accident had taken place in Hartford, and he drove over to capture some footage of it with his drone — footage similar to video he occasionally sends to local TV station WFSB. Though Rivera says he was standing outside the crime scene and the drone was hovering about 150 feet above the accident, well out of range of the one fatality, multiple officers surrounded and questioned him about his intentions. They asked that Rivera stop flying the drone, and when he did, an officer contacted administrators at WFSB. They told the station that Rivera had compromised the scene of the accident and coaxed them into suspending him for at least a week. The case is complicated for many reasons. First, Rivera was acting as a private citizen in this situation. Though he does work as a journalist at times, he was allegedly not being paid for any footage he captured at the scene of the accident. Second, though the Federal Aviation Administration does not condone the use of drones for commercial purposes, journalism does not clearly fall under the commercialism umbrella. Finally, the FAA’s regulations dealing with small unmanned aircraft are unclear. But this guidance is still only that — not law, — and it’s still unclear how the FAA classifies a commercial enterprise. When Rivera sends his drone into the sky, is he a hobbyist or a businessman? If a business uses his footage but he is not paid for it, where does that leave him? These questions can quickly lead down the path to another big question: Should journalists be allowed to use drones? Rivera’s case is still that of a man allegedly acting in a private capacity at the time he was approached by police. The FAA is investigating the matter, and this case could provide one of the few building blocks that leads to clearer regulation of drones for private and commercial use. Cases that ask questions about journalists’ use of drones are likely to continue cropping up in the face of murky regulations. Raphael Pirker, for one, was fined $10,000 by the FAA after the University of Virginia paid him to take video of the campus with a 4.5-pound drone in October 2011. The FAA alleges that Pirker flew his drone recklessly, risking property damage and injury to people in its flight path. Pirker is fighting the fine, and his fate, like Rivera’s, is yet to be decided. When settled, perhaps the drone regulation picture will be a little less foggy.